The manufacturer does not allow us to advertise our special price because it is so low. Please add this item to your cart to view our special price. Adding the item to your cart does not obligate you to purchase the product. You are also welcome to call us for pricing if you prefer. Finally! A portable oxygen concentrator that delivers a continuous flow and weighs only 10 lbs. Respironics has always been committed to improving quality and mobility to simplify user therapy with innovative products. 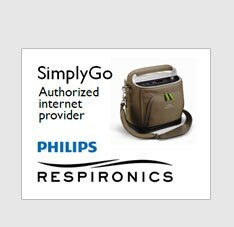 The SimplyGo is Philips Respironics latest advancement in oxygen therapy. The SimplyGo was designed as the only portable concentrator to weigh ten pounds; offer continuous flow of 2 liters per minute and a pulse dose (bolus dose) delivery of up to 6 liters per minute. FREE 1 additonal battery through January, 2017. Savings of $225! We are a SimplyGo Authorized Internet Provider! Please call us for special discount internet pricing. 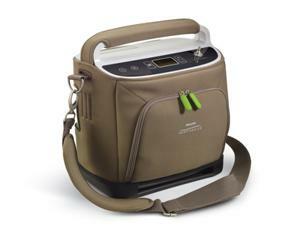 The SimplyGo is a new class of portable oxygen concentrators; it is lightweight, compact, and easy to use. With its high restraint design, oversized cart wheels, and long life compressor the SimplyGo was built for reliable performance from day to day for the most active of users. During development, the SimplyGo was tested and subjected to extreme impacts, vibrations, and temperatures making the SimplyGo one of the most reliable portable oxygen concentrators on the market giving new meaning to ruggedness. The SimplyGo is unique from other small portable concentrators because it is capable of delivering a continuous flow of up to 2 liters per minute as well as a pulse dose of up to six liters per minute. ( A pulse dose is the delivery of a burst of oxygen that is prompted when the user takes a breath) Because the SimplyGo has an output of up to four times the volume of many of the other lightweight POC’s in the marketplace, the SimplyGo is able to meet the needs of virtually all patients needing oxygen therapy including those that are extremely active and prescribed a continuous flow. Including patients needing increased pulse settings at night, CPAP, and BiLevel users. By setting the SimplyGo to Sleep Mode the unit will deliver a softer pulse, provide increased trigger delivery and exceptional comfort. The SimplyGo was designed with your safety in mind. Allowing for altitudes of up to 10,000 feet, lengthy battery life and by including Alarms for low oxygen purity, high breath rate, no breath detection, depleted battery, wrong battery and an alarm for system technical fault you can enjoy outings, travel, and sleeping knowing that your SimplyGo will alert you of needed adjustments. The SimplyGo was not only made to last, it comes with an attractive and neutral carrying case; fold up mobile cart; intuitive, easy to read screen and Velcro detachable accessory bag. Additional batteries, a zippered pouch and accessories are available for extended use. The SimplyGo is FAA approved and has a 2 year warranty. Please contact us if you have any further questions. *Additonal Desktop Charger is an option if you order the package with more then 2 batteries!